The tools - mainly blades and backed knives from the Howiesons Poort - were found in various layers in the Klipdrift Shelter, in the southern Cape in South Africa. They were examined by a group of lithic experts, who found distinct similarities to tools from sites in South Africa's Western Cape, over 300km away, in particular with the Diepkloof Rock Shelter site. 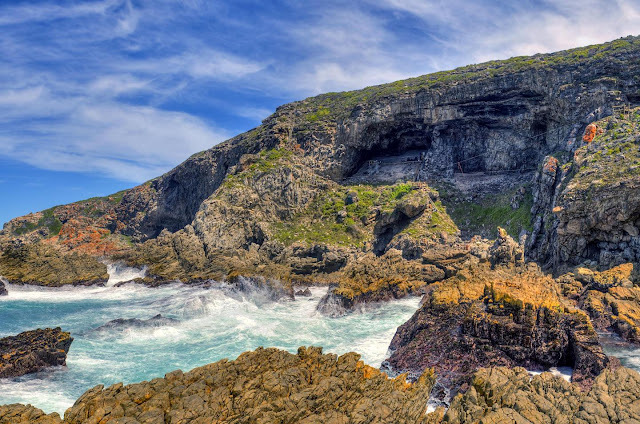 "While regional specificities in the tools from the various sites exist, the similarities of Klipdrift Shelter with the site of Diepkloof Rock Shelter are astonishing," says Dr Katja Douze, the corresponding author of the study that was published in PLOS ONE. The team, under the leadership of Professor Christopher Henshilwood from Wits University and the University of Bergen's SapienCE Centre for Early Sapiens Behaviour, examined thousands of stone tools that were excavated from seven layers that represent a time period of between 66 000 years ago and 59 000 years ago, to establish the differences in stone tool design over time. 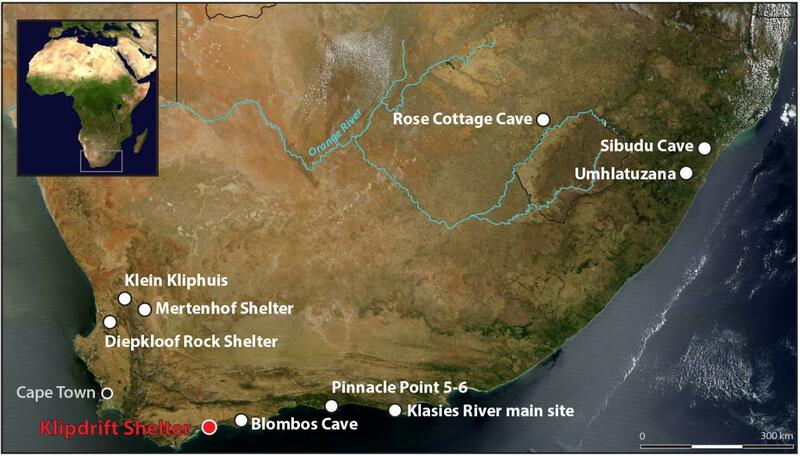 They then also compared the stone tools to various other sites in Howiesons Poort. "The site of Klipdfrift Shelter is one of the few containing a long archaeological sequence that provides data on cultural changes over time during the Howiesons Poort," says Douze. "This makes it perfect to study the change in culture over time." However, what was even more exciting for the researchers was the fact that for the first time they could show closely networked interaction between distant communities through the way they designed stone tools. "There was an almost perfect match between the tools from the Klipdrift and Diepkloof shelters," says Douze. "This shows us that there was regular interaction between these two communities." "This is the first time that we can draw such a parallel between different sites based on robust sets of data, and show that there was mobility between the two sites. This is unique for the Middle Stone Age," says Douze. The Middle Stone Age in Africa stretches from 350 000 years ago to 25 000 years ago and is a key period for understanding the development of the first Homo sapiens, their behavioural changes through time and their movements in-and-out of Africa. Named after Howieson's Poort Shelter archaeological site near Grahamstown in South Africa, the Howiesons Poort is a specific techno-culture within the Middle Stone Age that evolves in southern Africa after 100 000 years ago at the Diepkloof Shelter, but between 66 000 - 59 000 years at most other Howiesons Poort sites. The characteristics of the Howiesons Poort are strongly distinctive from other Middle Stone Age industries as it is characterised by the production of small blades and backed tools, used as hunting armatures as much as for cutting flesh, while other MSA industries show flake, large blade and point productions. The tools found in the deeper layers of the Klipdrift Shelter that represent the earlier phases of the Howiesons Poort were found to be made from heat-treated silcrete, while those from later phases were made from less homogeneous rocks such as quartz and quartzite. This change happens together with changes in tool production strategies. "The changes over time seems to reflect cultural changes, rather than immediate alterations forced on the designers by changes in climate", says Douze. "Our preconceived idea of prehistoric groups is that they just struggled to survive, but in fact they were very adaptable to environmental circumstances. There seem to be no synchrony between modification in design choices and environmental changes. However, the aridification of the area over time might have led to a very gradual change that led to the end of the Howiesons Poort." The team also attempted to establish why and how the Howiesons Poort ended, and to see whether it came to a sudden, or gradual end. "The decline of the Howiesons Poort at Klipdrift Shelter shows a gradual and complex pattern of changes, from which the first "symptoms" can be observed much earlier than the final abandonment of typical Howiesons Poort technology and toolkits," says Douze. "This does not support a catastrophic scenario involving alarming demographic drops or massive population replacements. The fact that a similar pattern of gradual change has been described for at least three other southern African Howiesons Poort sites (Rose Cottage Cave, Diepkloof Rock Shelter and Klasies River main site), further ascertains convergent evolutions in cultural trajectories rather than isolated groups promptly reacting to locally determined pressures."